Do you know what dangling participles are? Do you know that you should avoid them? First things first. What are participles? Let's not get ahead of ourselves here. You need to learn about participles first. Participles are a type of verbal. That means that they're formed from verbs, but they don't act as verbs. Participles act as adjectives. Let's check out some examples of participles, shall we? Psst! That thing is a sentence diagram. Sentence diagrams show us how words are related. From the diagram, you can SEE that filtered is modifying water. Filtered is a participle. It's formed from the verb filter, and it's acting as an adjective. It tells us more about the noun water. Which water? The filtered water. Look at the shooting star! Shooting is a participle. It's formed from the verb shoot, and it's acting as an adjective. It tells us more about the noun star. Which star? The shooting star. Now that you understand participles, we need to talk about participial phrases. I know. 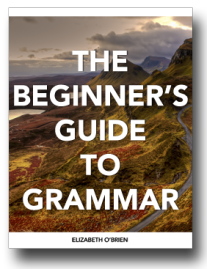 You just want to learn about participles that dangle, but trust me here. You need to learn this stuff first. You're being such a good sport. We're almost there. Participles can be in participial phrases. (A phrase is a group of words without a subject and a verb, acting as one part of speech.) A participial phrase consists of a participle and its complements or modifiers. All of the words in the participial phrase come together to act as an adjective. Stars shooting across the sky are beautiful. Shooting across the sky is a participial phrase. It contains the participle shooting and the prepositional phrase across the sky. The whole participial phrase is acting as an adjective modifying the noun stars. Which stars are beautiful? Stars shooting across the sky. Yay! You remember that participles act as adjectives, right? That means that they modify nouns. Sometimes, it can be difficult to tell which noun a participial phrase is modifying. In fact, the noun that it is intended to modify may not be stated in the sentence. That's not a good thing. When this happens, it's called a dangling participle because it just dangles there with nothing to modify. Sitting on the park bench, the sun disappeared behind the clouds. Sitting on the park bench is a dangling participle. Where is the noun that sitting on the park bench modifies? It's not modifying sun or clouds. In fact, the noun that it's modifying isn't even in the sentence! That poor participial phrase is just dangling there with nothing to modify. Poor thing. To fix participles that dangle, move them so that they come right before or after the noun or pronoun that they're modifying. Sitting on the park bench, I watched the sun disappear behind the clouds. Now, sitting on the park bench clearly modifies the pronoun I, so it's not dangling any longer! When participial phrases modify a noun other than the one intended, it's called a misplaced modifier. This makes sense because it's a modifier (an adjective), and it's in the wrong place. One great thing about them is that they're usually hilarious. Covered in mustard and relish is a misplaced modifier. It contains the participle covered, and it's modifying the wrong word. 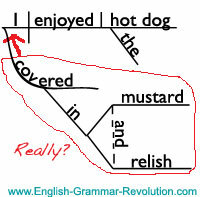 As the sentence is written, covered in mustard and relish is modifying I, but that doesn't make much sense! The intended meaning of the sentence is probably that the hot dog was covered in mustard and relish, but it says that I was covered in mustard and relish. To fix misplaced modifiers, move them so that they come right before or after the noun or pronoun that they're modifying. Covered in mustard and relish comes right before the pronoun I. We want to change it so that it's closest to the noun hot dog. Here's one way that you could fix that sentence. Covered in mustard and relish is now a regular, old participial phrase. It's not misplaced now because it properly modifies hot dog. Now you know that you should avoid dangling participles and misplaced modifiers unless you're trying to be funny.